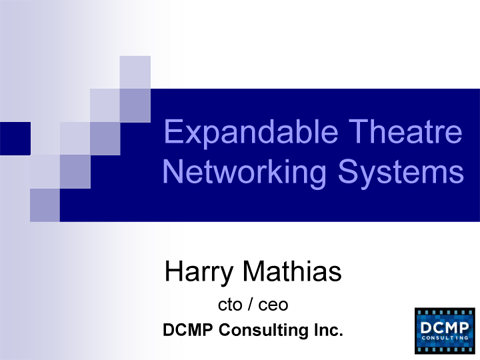 Many of the talks and presentations that Harry Mathias and his associates gives, are written for, and so are proprietary to our clients. Here is a recent presentations that are general in nature, or were done as a public service to the Cinema industry. We offer it here for downloading, in order to stimulate a general Industry dialogue on this subject. In addition to our professional consulting interest in the advancement of Digital Cinema, we have a personal dedication to seeing that this historic Cinema Industry change is a smooth transition. This talk discuses the proper rollout of a flexible cinema network in a theatre complex. It covers the steps needed to be prepared for future expansion of the installation, as your Digital Cinema installation grows. It suggests a strategy that enables an easy transition from film to digital, as this occurs, in the coming years. Very often, the cinema network in a theatre complex grow from one early "test projector" to a complete system in a sloppy and improvised manner, with no strategy or plan. This presentation discusses what issues to think about, when drawing up that very necessary plan. This public service educational presentation has been given by DCMP at Digital Cinema Technology conferences around the world. It was given at the ICTA Technical Seminar Series, and various other venues. This presentation is not motivated by any commercial or promotional motives. You may view the PowerPoint as a PDF by clicking on the graphic above, or by clicking here. Or download it to your computer by right-clicking the link and selecting "Save Link As..." from the drop down menu. You can also view some of our client companies here. For more detailed information or a services quotation contact us.